Who doesn't love sketches! This week Kerry issued a wonderful sketch for the Three Clovers Challenge. I liked it so much, I created TWO cards! I had originally planed to use "Got Stuffing" as the sentiment on this card, but it was a tad too large and covered part of the beautiful Turkey. Instead I combined Thankful from Vintage Words and For You from Words of Comfort (I used the omitting tech to only use part of the sentiment). The Turkey is from Kitchen Sink Stamps Multi Step Turkey Trot plate - isn't he handsome! I found him much easier to stamp out of order as follows on White card stock: #2 Pumpkin Pie, #1 So Saffron, #3 Memento Rich Cocoa. I sponged the edges in Soft Suede. The beautiful Gold layers on my card are Paper Temptress Gold Metallic Ultimate Glossy. I embossed the Tuscan Sun Brawny with the CuttleBug Damask Folder, and sponged the edges with Soft Suede. As I mentioned in my post the other day - I'm just LOVIN' the Brawny Card Stock for my embossing folders - the embossing is so deeply etched! For some added color I used a piece of Indian Summer paper from Basic Grey and added some Drywall Stitching. Nothing like jumping right from Thanksgiving to Christmas! I just love the vintage plates from Artistic Outpost, here I used portions of the Snowy Woods plate to complete the sketch. The Santa image is stamped in Riding Hood Red on White card stock, then sponged with Soft Suede Ink. The sentiment is stamped in Soft Suede on White card stock and sponged with Soft Suede Ink. 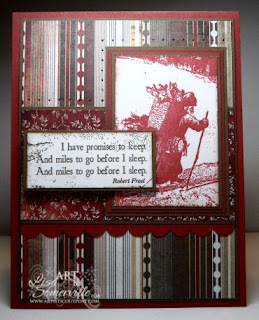 Don't forget if you own Artistic Outpost images - check out the Sketch Challenge here - grab your stamps and play along! Thanks for stopping by! Looking for more inspiration using Kerry's sketch, click on the Three Clovers Logo on my sidebar to see what the Kerry and the other Challenge Players created this week! I'll see you tomorrow for Bloggers Challenge! Lovin' your ART! Colors, paper, images are all Purr-fecto! Beautiful cards, I love the Winter Woods one! gorgeous intepretation of that lovely sketch. I bet you know which one is my favorite! Oooo...I love them both! It was a great sketch! Wow you did a fantastic job with this sketch and both your cards. That turkey looks fabulous and your Santa image is wonderful. These are awesome!!! Love that TURKEY! oh both of your cards are wonderful...at least you stopped and hit Thanksgiving LOL! Gobble, gobble..hehehe. Love both your cards. Gorgeous as ever. Great job with the sketch.